Bubby and Bean ::: Living Creatively: Become an April Sponsor! Hello lovely readers! This is just a quick reminder that April Sponsor spots are going quickly. Read on for more information on joining the Bubby & Bean team! 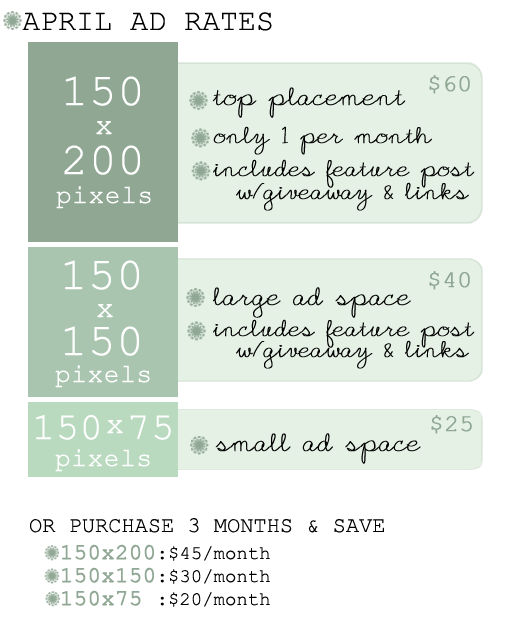 is an affordable, effective way to advertise your small business, blog, or Etsy shop. We have a wonderful group of readers who are creative spirits interested in design, fashion, art, vintage, travel, weddings, DIY projects, and eco-friendly living. BLOG: Since we began in November of 2010, our daily readership has grown at an incredible rate and continues to grow. In the past month alone, Bubby & Bean received over 22,500 page views, had over 6,400 unique visitors, and our number of subscribers has tripled. TWITTER: We have over 3,400 followers on Twitter, and tweet several times a day about new Bubby & Bean content. FACEBOOK: Between our combined Mountains of the Moon page and Bubby & Bean Art page, we have nearly 3,500 fans and growing. The Bubby & Bean Blog is linked on both of these pages, and we frequently post status updates with links to this site.